The mosaic of the Transfiguration at St Catherine’s. THE GREAT APSE mosaic of Christ’s Transfiguration in the Sinai church, today partly hidden from view by the tall sixteenth-century iconostasis, raises a number of questions: Most controversially, what message was it meant to convey? And, when and by whom was it done? In the apse the mosaic illustrates the Transfiguration as described in the New Testament, with Christ in a mandorla revealed to the prophets Elijah and Moses and to three apostles, John, James and Peter. At the top of the wall above the apse are two scenes from the Old Testament which occurred at Mount Sinai itself: Moses loosening his sandals before the Burning Bush and Moses receiving the tablets of the Law from the hand of God. 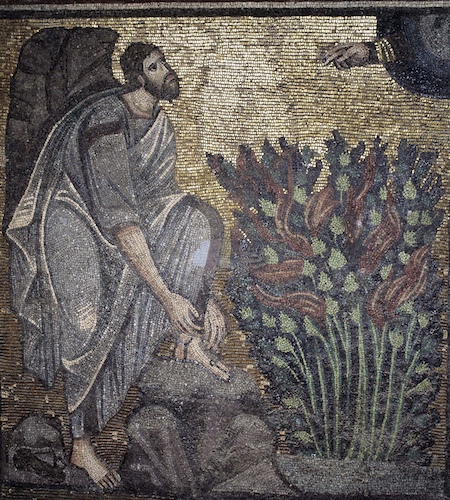 What message was this mosaic meant to convey to the sixth-century pilgrim? Why was there portrayed in the church at Mount Sinai the Transfiguration which took place on another mountain, that of Tabor in Galilee, in addition to the two Moses scenes that took place at Sinai itself? These two latter scenes are placed very high up on the walls [see detail here; image courtesy Roberto Nardi, CCA] and do not immediately attract the worshipper’s gaze, which is directed towards the apse. They are distant both spatially and temporally, the double meaning of the Greek word anôthen, both ‘from above’ and ‘from the past’. Clicking an image will open an enlargement. TO UNDERSTAND THE message of the Sinai mosaic we can do no better than read a sermon attributed to Anastasius Sinaites, said to have been a monk at the Sinai monastery in the seventh century. The sermon, whatever its exact date and authorship, was according to its text definitely delivered, not at Sinai but on Mount Tabor and explains at length the complementarity of the events at the two mountains. The Transfiguration in the New Testament was the fulfilment of Moses’ incomplete vision in the Old. On Sinai Moses did not see God face to face; on Tabor he, Elijah and the three chosen apostles were able to see Christ in His divine glory. On Sinai there was a dark cloud, on Tabor a luminous one. On Horeb (Sinai) Moses said (in the King James version), ‘I will now turn aside and see this great sight’, which in the Greek of the Septuagint reads, ‘Parelthon opsomai to horama to mega touto’. Parelthon means literally ‘having gone by’. What did he mean by that? He meant ‘after I have traversed my earthly life, after the period of the Law has gone by’. Only then will the great sight of the New Dispensation be revealed on Mount Tabor, and Moses will be there to see it. Furthermore, the Transfiguration was only made known after the Resurrection, for Christ said (Matthew 17.9), ‘Tell the vision (to horama) to no man, until the Son of Man be risen again from the dead’. The Sinai mosaic may be read to reveal further layers of meaning. Moses, for example, is shown growing older in age in each of the three scenes in which he appears. He is in his prime before the Burning Bush, grizzled when he receives the tablets of the Law and very old in the Transfiguration. True to Anastasius’s formulation, he has ‘traversed’ his life before being deemed worthy of the divine vision. 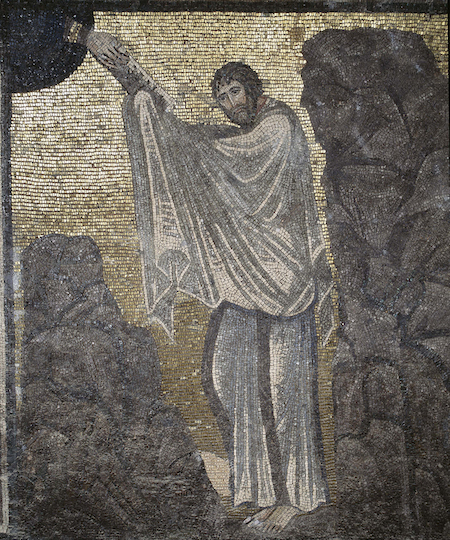 Elijah, whose very cave was above the Sinai monastery, wears not only his traditional mantle of sheepskin, but also a thin black belt decorated with white crosslets, the kind of belt worn by Christian monks. He represents, therefore, the archetypal monk, Christian by anticipation, and indicates that the monk, like himself, may attain to the sight of God. Some of the mosaic work is excellent as in the figure of Christ, some anatomically and compositionally weak. The prostrate figure of St Peter appears to have two left feet and only one arm. Some of the mosaic work is excellent as in the figure of Christ, some anatomically and compositionally weak. The prostrate figure of St Peter appears to have two left feet and only one arm. The absence in the mosaic of a solid ground line is also disconcerting to the modern eye. 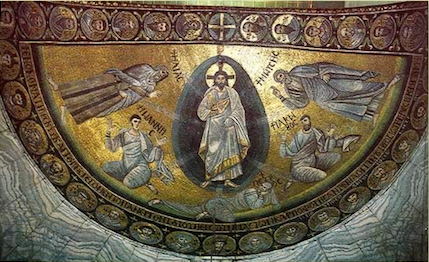 Later Byzantine representations of the Transfiguration always include a craggy mountaintop, but in the Sinai church there is only a horizontal strip shading off from green to yellow as it is illuminated by Christ’s radiance. While the prophets Elijah and Moses stand securely upon this strip, the three frightened apostles appear to levitate. The kneeling posture of John and James and Peter’s prostrate figure require more solid support. It may be that the model the artist was following included the summit of Mount Tabor. Or did he omit it intentionally to make the scene more timeless and less specific topographically? The second two questions posed at the outset concerned the date and authorship of the mosaic. All the evidence at our disposal comes from the mosaic itself. At the base of the apse is an inscription in dark letters on a gold ground which reads: ‘In the name of the Father, the Son and the Holy Spirit this entire work [i.e. the mosaic] was done for the salvation of the donors [karpophorêsanton] at the time [or during the tenure: epi] of the most reverend Longinus, presbyter and abbot’. This, the main part of the inscription is complete: it starts with a cross and ends with a cross. Then, added on a second line in smaller white letters on a dark ground are the words: ‘By the effort (spoudé) of Theodore, presbyter and assistant abbot (deuterarios), indiction 14’. NONE OF THE named individuals can be securely identified. The indictional date tells us only that the work was carried out in the 14th year of any successive 15-year tax assessment cycle excluding 550-51, when the abbot was called George, and naturally after the completion of the church building itself (after 548). It could have been 565- 66 (the Byzantine year starting on 1 September), 580-81, 595-96 or even later, but most probably before the political upheavals of the seventh century which isolated Sinai from the Byzantine world. The inscription tells us something else: the execution of the mosaic was not, unlike the church itself which was built by the emperor Justinian, carried out under imperial auspices, for that would have been stated in the inscription. It was a local effort financed by private donors and taken in hand by the aforementioned Theodore, who seems to have been awarded less credit that he deserved. For at either end of the inscription are portraits of two contemporary clerics, distinguished by their lifelike features and their square ‘haloes’ (a convention which indicates that the person depicted was still alive): on the right the abbot Longinus, blue-eyed and heavy-jowled; on the left, not, as might have been expected, Theodore, but a certain deacon John, whose identity remains unknown, perhaps an important donor. Granted that the execution of the mosaic was a locally financed operation, we may suppose that the artists recruited for the job were drawn from nearby urban centres — not Constantinople, as art historians hasten to assume, but perhaps Alexandria or Palestine. From a purely conventional point of view the work they produced was somewhat uneven in quality, as described above. However, despite the local nature of the project there is notable sophistication in the use of the iconography. I have not dwelt on all the features of the Sinai mosaic that call for theological interpretation, only on those that appear to me certain and unforced. My purpose was to show the layers of meaning that the art of the Early Church produced by very simple means, yet require an acquaintance with Christian exegesis. Cyril Mango is Bywater and Sotheby Professor Emeritus of Byzantine and Modern Greek Language and Literature, University of Oxford. This essay first appeared in the June 2014 number of Sinaiticus, the newsletter of The Saint Catherine Foundation. It has been republished online in The Fortnightly Review with permission. More — From the Getty Conservation Institute: The Conservation of the Mosaic of the Transfiguration in the Monastery of Saint Catherine in Sinai. An address and video by Roberto Nardi. 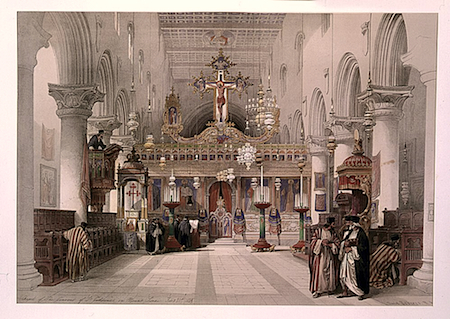 And in the Fortnightly: The Bedouin of St Katherine by Dr Hilary Gilbert, From the Øιλοκαλíα to Franny’s pea-green book by Rev Prof Andrew Louth, and Cosmos, Life, and Liturgy by Juliet du Boulay. This Fortnightly Review article is filed under the following rubrics: Art & Architecture, History & Travel. Publication: Sunday, 27 July 2014, at 22:01. Options: Archive for Cyril Mango. Bookmark the permalink. Follow comments here with the RSS feed. Post a comment or leave a trackback.